The definition of what public art is has slowly evolved over the last two decades from large-scale sculptures to urban interventions in the public domain. Malcolm Rains, professor of Cultural Theory in the School of Architecture, Design and Environment at the University of Plymouth discusses in his book, Art, Space and the City: Public Art and Urban Futures, some of the implications of art in the public sphere. One dilemma he has observed is that cities and corporations have integrated public art as a strategy for urban regeneration. When this occurred public art fell between the realms of art and urban planning and debates on the role contemporary art and its contribution to the future of cities has been neglected. Because of the exploitative agendas of “beautification” by municipal governments and corporations, public art has become institutionalized and bureaucratized and the term (public art) has become ineffective in describing what it constitutes. Cities and corporations should be examining the role of art in public spaces and how might it contribute to the urban future instead of focusing on achieving more hospitable urban environments. What is the function of art in the public sphere? The main concern for public art should be an engagement with the pubic realm and sculpture or installation practices that reflect what is happening presently. Public art should pose the question about the relationship between art, architecture, urban planning and the city. It should be seen as an enhancement of urban identity and social space and not just a decorative embellishment of the inner cities. I am interested in public art that trespasses into the everyday world either by interrupting or co-opting the tropes of the city and urban geography. I want to be challenged and be introduced to a new way of looking at the city and how it might function differently by opening up new possibilities of perception. The Elevated Bench is urban furniture with a view. the public benches are constructed at the top of spiral staircases that climb streetlight poles, providing a new perspective on the city streets. 21 Balançoires is an installation in the front of Université du Québec à Montréal’s Science Faculty. The installation is a giant collective instrument made of 21 musical swings; each swing in motion triggers different notes, all the swings together compose a piece, but some sounds only emerge from cooperation. The project stimulates ownership of the new space, bringing together people of all ages and backgrounds, and creating a place for playing and hanging out in the middle of the city centre. Musical interpretation by composer Radwan Ghazi-Moumneh. Kim Beck presents three sculptures resembling the skeletal framework behind advertising billboards. These blank forms emulate the abounding indicators of the economic recession, such as empty storefronts and “For Sale” signs. Beck’s sculptures have the illusion of depth when viewed from the front, but as visitors move past them, the side views reveal that they are completely flat, cut from perspective drawings and built like theater props. 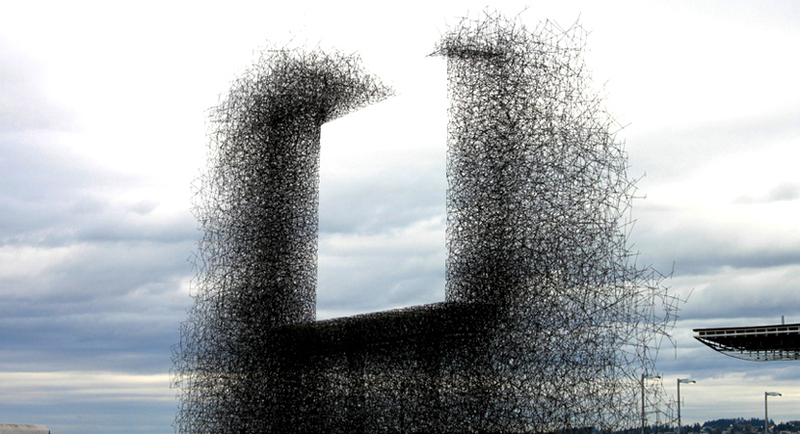 Non-Sign II is an installation by seattle based art collective lead pencil studio located at the canada-US border near vancouver. the sculpture is made from small stainless steel rods that are assembled together to create the negative space of a billboard. while most billboards draw attention away from the landscape non-sign II frames the landscape, focusing attention back on it. It is a colourful installation and a great concept for sand. As I have mentioned before I wish more colour was introduced to public projects but especially playground structures. What colour is the sand now? Is it still bright or kinda rich brown?